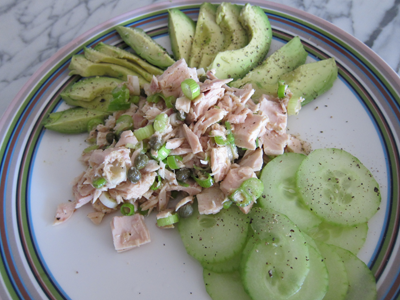 Post-Workout Eats: Mediterranean-style Albacore Tuna Salad | eat. live. paleo. For my post-workout lunch, I like to make a Mediterranean-style tuna salad. I use a 5 oz. can of wild albacore tuna packed in water. The salad is very much the same as the sockeye salmon salad I make for David, but instead of mayonnaise I use a drizzle of olive oil. To make the salad: drain the can, and put the tuna in a glass bowl. 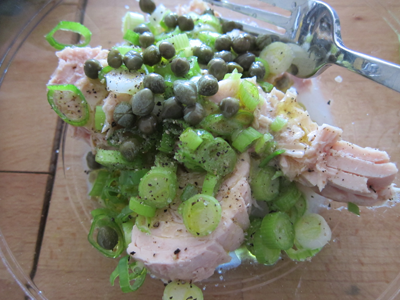 Add: about a half handful of capers, a stalk of scallion, finely chopped, juice of half lemon, and a drizzle of good quality, organic olive oil. Season with salt and pepper to taste. Mix well, and serve over salad greens… or eat with some sliced avocados and cucumbers, as I did for lunch today. Thanks for the simple lunch can’t wait till lunch time now 😉 U Rock! !